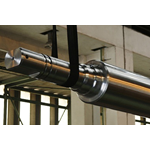 Manufactured with the most modern liquid forging hydraulic presses, these rolls guarantee an excellent level of chemical pureness, as well as good metallurgic structure and resistance when rolling in severe conditions. The heat treatment is carried out with the most modern equipments and by means of double and progressive induction, what guarantees the resistance of use, surface quality and wear resistance demanded in the mills. Our Work Rolls for Cold Strip Mills are developed to offer a great variety of textures and finishes. Work Rolls may obtain different specific hardness depending on the application to be used. Products with deeper hardness are also available and show excellent performances.